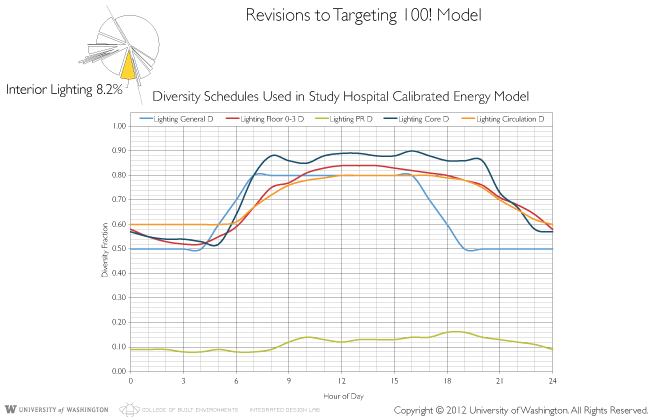 As part of the effort to correctly characterize how operational hospitals actually use energy, this team worked closely with Legacy Salmon Creek Medical Center (LSCMC) to gather data about how an operational hospital uses energy for its complex operation. It is an example of a state-of-the art operational healthcare facility, located in Vancouver, WA. 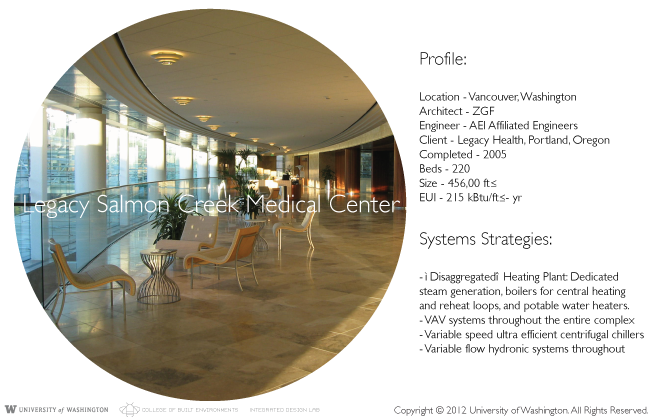 Designed by Zimmer Gunsul Frasca Partnership and Affiliated Engineers, Inc., it exemplifies sound engineering and architectural design, and performs better than the average hospital in the United States today. As a relatively new facility, it provided a good foundation for the team to determine how a hospital uses electricity and natural gas for it’s complex operations. The detailed data collection and analysis from this study hospital confirmed some of our understandings of how hospitals use energy, and provided data to show that some of our previous assumptions needed either modification or correction. 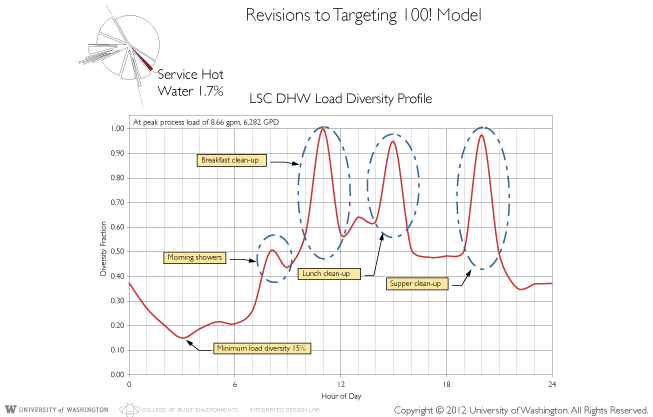 These data provide detailed information for energy modeling simulations including calibrated diversity and load profiles. This detailed monitoring study helped confirm that re-heat is the largest end-use in the hospital. In this case re-heat consumes over 40% of the hospital’s energy. 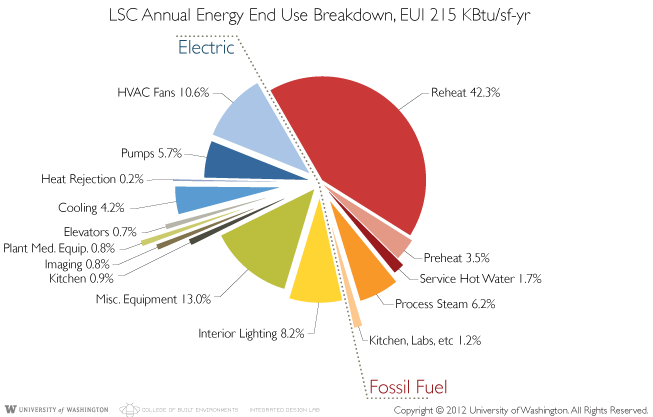 Some results led to modifications to commonly perceived energy use patterns. For example, heating energy for service hot water was less than 2% of the total and the data indicated that this was mostly related to cooking activities with peaks three times during a typical day. As hospital patients become more acute, fewer showers are taken at the hospital, representing less energy consumed for this end use. Similarly, patient room lighting was observed to use much less energy than expected and as compared to their connected load, whereas general lighting followed a more expected schedule of operations. Imaging equipment, notably MRI machines, were long thought to be large energy users. 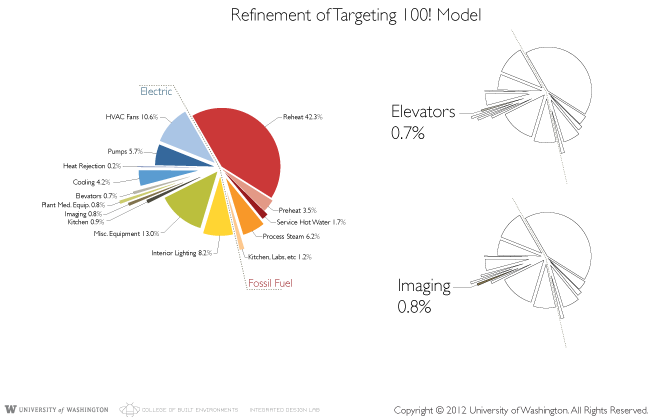 But study results indicate all imaging equipment accounts for less than 1 percent of energy use. Elevators represent a similar load, utilizing less than 1% of the total energy in the hospital. This information helped the study team to focus on larger energy users, rather than devoting time and effort to areas that would result in very small relative gains. 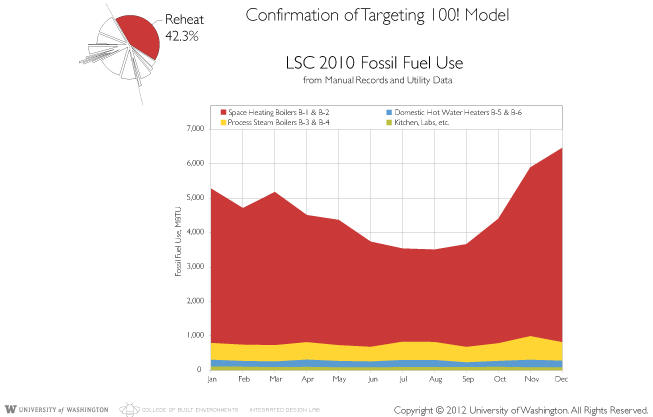 It also enabled the development of more predictive energy models for Targeting 100! that match actual acute care hospital patterns of use.